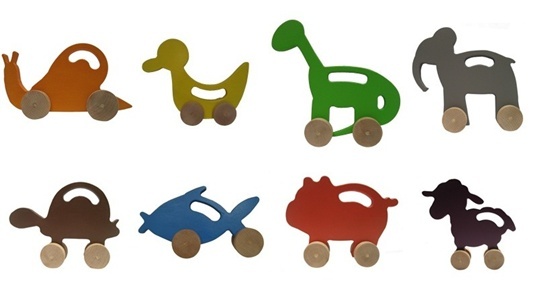 Manny & Simon offers a delightful array of sustainably made rolling wooden toys. Their collection of little animals is made with 100% post-industrial recycled wood residuals and painted with non-toxic and ultra low odor paint. Manny & Simon toys are well-designed and eco-friendly; and your little one will love forming a parade with these playful rolling creatures which include a colorful cast of: dino, elephant, turtle, snail, fish, lamb, duck and pig.